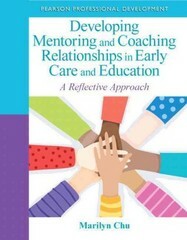 Developing Mentoring and Coaching Relationships in Early Care and Education 1 Edition Developing Mentoring and Coaching Relationships in Early Care and Education is the ideal resource for anyone charged with guiding teachers as they encounter real world challenges in today’s early childhood programs and can turn to this practical new resource as they work with supervisors and teacher-leaders to achieve greater professional effectiveness while bridging the gap between the vision for quality and actual practice. The book is packed with helpful reflective questions, illustrative mentoring and coaching scenarios, and ready-to-implement planning tools. The focus is on encouraging reflection on current practices in order to achieve quality programs, meet teaching standards, and promote positive outcomes for children in these times of rising standards and, in many cases, lower levels of support.